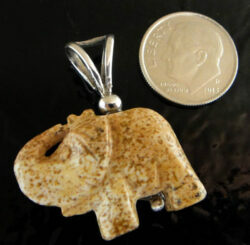 Picture jasper jewelry from Glassando includes carved picture jasper, picture jasper pendants, picture jasper and sterling silver jewelry, and more! This light brown stone is sure to delight lovers of opaque gemstones or neutral colored jewelry. Handmade picture jasper jewelry from Glassando is a great choice for lovers of brown jewelry, opaque gemstones, uncommon natural gemstones, or hand-carved jewelry. In addition to shopping on our website you can view lots more handcrafted jewelry and natural gemstone jewelry inside our retail store. Glassando is a locally owned boutique jewelry store located in downtown Iowa City. Our store can be found on the first floor of the Old Capitol mall, which can also be called the University Capitol Center or the Old Capitol Town Center. This building is located conveniently near the University of Iowa Campus, right next to the University Pentacrest. Glassando is open 7 days a week!